Slabjacking, or mudjacking as it is commonly called, is a cost effective alternative to replacing sunken concrete. Concrete is lifted by drilling penny sized holes through the slab, and pumping polyurethane foam underneath the slab. As the foam flows beneath the surface, voids and depressions are filled and the slab is raised to achieve the desired height. Polyurethane Foam can be used to raise almost any type of concrete structure. 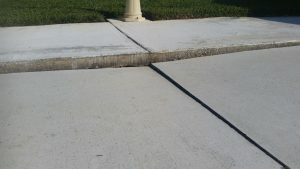 Call Poly Lift USA today to talk to one of our highly trained professional about your concrete leveling needs.